Undoubtedly, the king of Greek street food is the world-famous souvlaki. Literally everywhere to be found all around the country, it is perhaps the cheapest way for you to enjoy a full meal. Fresh vegetables, fries and delicious sauces such as tzatziki, are sided with meat wrapped in warm pita bread. There is a variety of meat you can choose to add to your souvlaki such as gyros, chicken or lamb. In some places, there might be vegetarian options available such as halloumi cheese or falafel. Tip: Ordering souvlaki in Greece might turn out to be quite a task depending on where you are. In Athens and generally in the southern part of the country souvlaki means the whole snack while in Thessaloniki and the northern part of Greece this is not the case. There, you have to ask for a pita with souvlaki, otherwise, you will end up holding just a skewer of meat. The most popular street snack in Greece though is the koulouri. This snack is to be found all around the eastern part of the Mediterranean Sea and the Balkan countries, but each country claims to make it in a different way. The traditional form in Greece is of a circular thin bread with lots of sesame seeds covering it. It is still the favorite breakfast option for Greeks along with a cup of Greek coffee. Get yours from a traditional vendor on the street! In case you feel hungry while walking around Athens or another Greek city, the cheapest way to fill your tummies is to choose from an array of traditional pies. Spot the nearest bakery shop and get the chance to try spanakopita (spinach pie), tyropita (cheese pie), or ask the baker to recommend something new. When it comes to pies, the sky's the limit! Each region is particularly famous for a type of pie depending on the season and the ingredients. Therefore, keep your eyes open and follow the scent of the freshly baked fyllo (pastry sheet) to enjoy a piece of a traditional Greek pie! Except for the options mentioned above, there is always more street food when visiting Greece. From seafood to middle-eastern delicacies, Greece has it all! Do not hesitate to ask the locals and find the place that suits you best! A quick bite is nice, but not as nice as mousaka or pastitsio. Layers of flavor in the form of mince, pasta, and béchamel await you in every restaurant. These are a few of the innumerable choices that Greek restaurants have to offer. One of the best places, among many others, to try local dishes in the heart of Athens is 'Lesvos', the meze restaurant in the neighborhood of Eksarxeia, where you can try delicacies from the island of Lesvos in affordable prices. The local dishes of grilled octopus and fried courgette balls and local cheeses will make your mouth water, while its friendly staff and old-time aesthetic will seal the deal! Other areas that Athenians love to go out for food is the picturesque neighborhood of Psyrri and Monastiraki right at the old city center. There, you will find endless options for you to choose from. 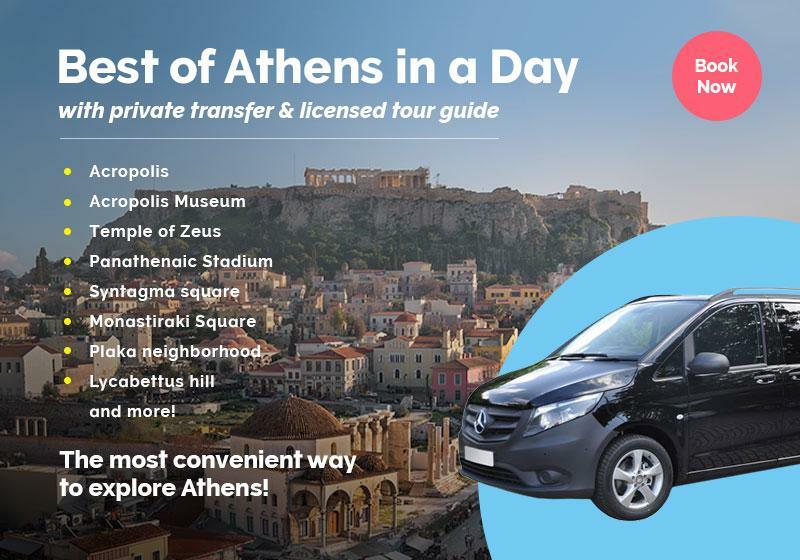 All you have to do is to have a walk through those neighborhoods and find a place with the magnificent view of the Acropolis as your background! You are in a foreign country. It is normal not to know where to go and what to eat. Loving food is a requirement for being Greek. So, ask some locals to show you a good place to eat. Most probably, they will introduce you to a cheap, hidden, small restaurant where you are going to taste wonderful flavors. If they join you in your meal, they might offer to pay the bill. Don’t insist and don’t refuse their offer. Greek people are hospitable, and this is their way to show it to you. Show your gratitude and enjoy. Once you find the cheap, great restaurants, you will enjoy not only the food but also the hospitality of the owners. They will propose certain plates to you. Don’t refuse. They know better, and they want you to have a good time. They will also treat you something to drink. Usually, it is a traditional, Greek drink like ouzo, tsipouro or wine. Don’t say no. Drink with them, but be careful not to get drunk. Keep in mind that these beverages are quite strong. You can just take a sip and thank them for their hospitality. Another thing that you should not be too stressed about your table manners. In many occasions, Greeks prefer to use their fingers rather than cutlery. Follow their lead and you might notice that food tastes better that way. If you are enjoying your food, don’t hold back. Offer your congratulations to the people responsible for. They will appreciate your kindness. Tips are not as common in Greece as they are in other countries, but feel free to tip if you want to. Don’t worry about the amount of money. Your gesture is more important. In conclusion, the Greek eating etiquette consists of few and simple rules. Don’t settle for less when it is easy to find more, cheaper, and better food. Don’t say no to treats and offers, but don’t overdo it. Compliment and show your gratitude to the owners and waiters. Be open to advise from the local people and explore the culinary beauty of Greece. Plan your own culinary exploration of Athens or check one of our Greece tours.